Three British Invasion heavyweights collided on Sunday night at Paul McCartney’s latest Freshen Up Tour stop, representing The Rolling Stones and The Beatles on one of the latter’s classic tracks. Ronnie Wood and Ringo Starr joined Macca onstage to perform “Get Back” at the O2 Arena in London. The performance marked a rare Beatles mini-reunion, with the two surviving members appearing (and the Stones factor making it just that much better). 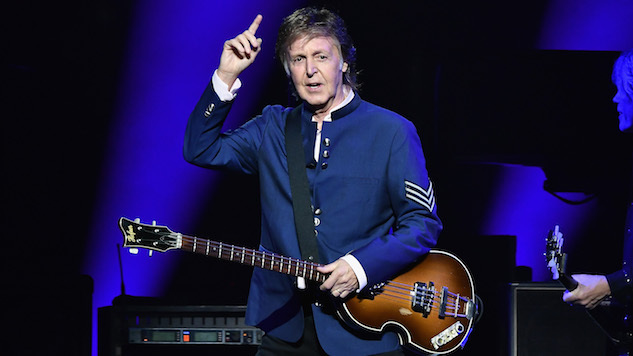 On his Freshen Up Tour, McCartney has been pulling out career-spanning tracks from his time with the Beatles, his time with Wings and his solo work. The latter two musical ventures have been particularly newsworthy as of late, with McCartney remastering and releasing two Wings-era albums (Wild Life and Red Rose Speedway) loaded with previously unheard content and, of course, his most recent solo album Egypt Station, which gave the Brit institution his first No. 1 Billboard debut in over 36 years. Check out fan-shot footage and photos of the performances and revisit a 1990 Macca performance from the Paste archives below. Find McCartney’s upcoming U.S. tour dates beneath that.